It’s time to spoil the boys! Although they may not be the most organised on ground, the boys still deserve to be spoiled and shown how special they really are to you. 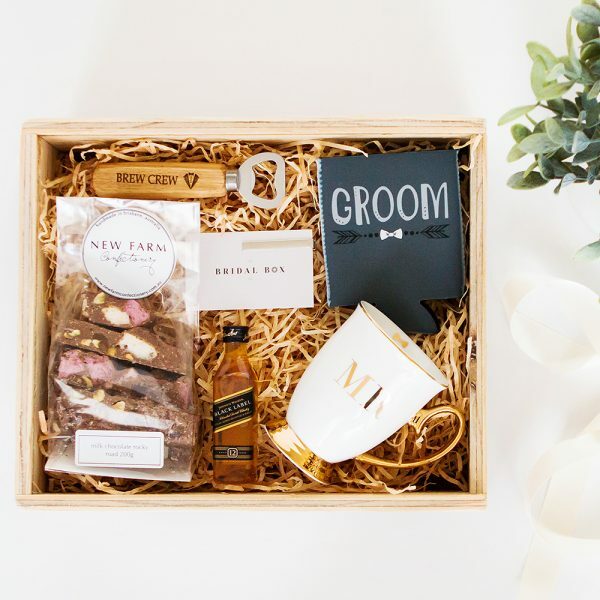 The Bridal Box Co also provide you with a select range of gifts to place within the boxes. Browse through these and order by clicking on ‘Gift Box Items’ in our menu. All our beautiful boxes are hand made with love from a family owned business in Hills of Byron Bay. Each box is hand crafted and sanded, creating a wonderful sense of uniqueness and character. They are left untreated so unfortunately are not able to be shipped outside of Australia. All of our boxes are wrapped with double sided satin ribbon in either of our colour options: Bridal White, Bridal Grey or Ivory. 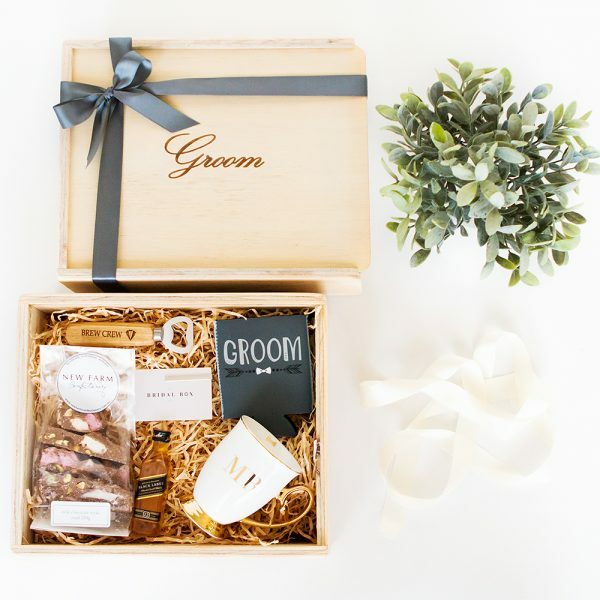 The boxes listed ‘Gift Box Only’ come with the box, engraving, ribbon and wood fill. Any additional items you would like to include can be added at the additional cost that is listed. Every piece of wood is not the same. These gift boxes are not factory made, they are hand sanded and every one turns out unique. Our boxes are sold raw and we call imperfections character. We wouldn’t sell one that we didn’t trust for strength or love ourselves. Due to processing times, all our orders will be processed and sent within three weeks. All orders are sent via Courier and will have a tracking number attached, that will be sent to the purchaser. Internal measurements of the Double Champagne Boxes are 21cm W x 33cm L x 10cm D.
The size of letters for engraving may differ between boxes depending on the wording and amount of wording chosen. We will select the appropriate size of letters to ensure the best possible outcome. 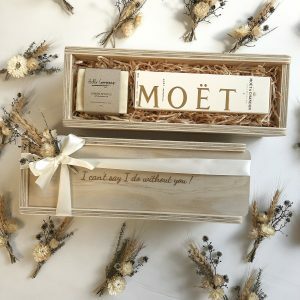 Moet boxes are included in the box upon availability as they are sometimes not available from a supplier level.